Kawasaki has announced their 2012 ATV lineup, and it looks to be a very promising year. This is especially true in the mid-sized sport utility market with the all-new Brute Force 300. Chances are high that this is the only quad in the lineup you truely want to hear about. Nothing against the other units from Kawasaki, but this is the one making a stir. Much of the talk is because Yamaha is also jumping back in the 300cc market with it’s Grizzly 300. The Brute Force 300 replaces the Bayou 250 and is in no way comparable to it. The stylings are forged directly from the bigger Brute Force units. The 300 uses a 271cc single-cylinder, four-stroke engine combined with a continuously variable transmission (CVT). The 537 pound, 2wd machine sits atop 22 inch Maxxis tires. It is the only 2wd machine on the Kawasaki sport utility lineup. The dash is very advanced for ra 300 taking many features from its big brothers, including speedometer, odometer, a clock, fuel guage and coolant temp light. You can pick one up in black or a dark shade of red for an MSRP of only $4,199. Look for a more in-depth review coming soon. Oh, you’re still reading? Well, then allow me to cover the rest of the Kawasaki offerings. The next unit is the Prairie 360 4×4 with its 362cc, single cylinder, four-stroke powerplant. Like the Brute Force 300, it uses an automatic transmission and is shaft driven. It has push-button four wheel drive to get all four of the 25 inch tires working for you. It weighs in at 643 pounds but should easily be stopped with its dual front hydraulic disc brakes and seal muli-disc rear brakes. It comes in Scout Green and the Aztec Red found on the Brute Force 300. It will set you back $6,199 according to the MSRP. From 362cc to 633cc is a big jump but that is a sacrifice you will have to make if the Prairie doesn’t turn you on. 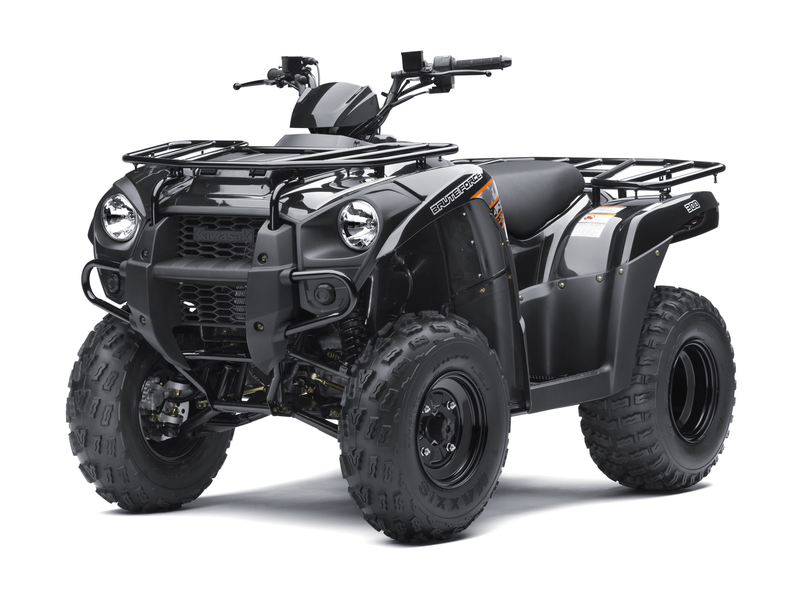 The Brute Force 650 4x4i’s engine is a 90-degree V-Twin four stroke that runs through a dual range automatic transmission. Another upgrade is independant rear suspension. The front brakes are also upgraded to dual piston discs. The 650 is available in Scout Green or Adventure Blue. The size increase will decrease the weight of your wallet, setting you back $8,099 MSRP. The Brute Force 750 line has been a fan favorite since it’s release. Followers will be excited to see there have been upgrades like more power to the 749cc digital fuel injected 90 degree V-Twin engine. Other upgrades include 6 spoke cast aluminum wheels and cosmetic features for improved looks and ergonomics. The 750 is also available with eletronic power steering as well as a Reatree APG HD Camo edition. MSRPs are $9,299 for the base model (if you can call it that), $9,999 for EPS and $10,349 for the EPS in camo. Kawasaki has no desire to disappoint the sport market either. The KFX 90 is an 89cc single cylinder four stroke that is perfect for young riders. The 90 is chain driven keeping true to race stylings and simplicity. 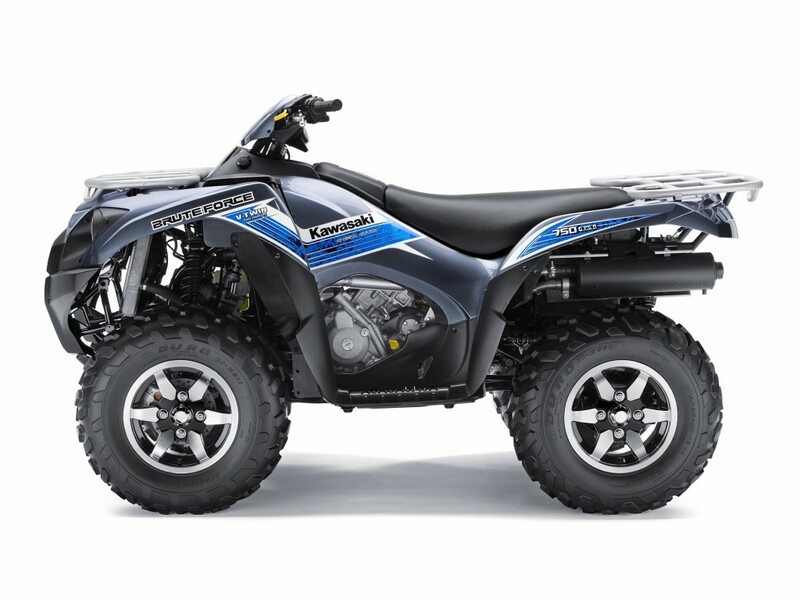 At an MSRP of $2,699 you are investing in a lifetime of fun by creating an new ATV enthusiast. Other Kawasaki sport ATVs like the KFX 450r are expected but have not officially been announced at this time. For more details about these and other Kawasaki offerings see your local Kawasaki dealer or visit http://www.kawasaki.com.